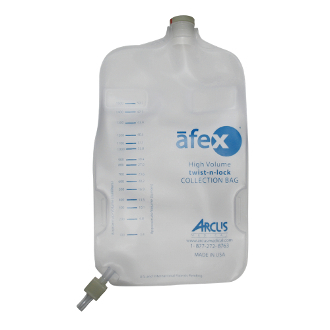 The extra capacity Afex collection bag can collect twice the volume (up to 32 oz) compared to the standard collection bag and is double sealed for increased protection and durability. Our proprietary backflow valve ensures liquid stays in the bag during movement and activity. The secure drain clamp allows users to easily empty the bag at their convenience. Standard security tabs enable users to easily secure the collection bag to the Afex brief. The extra capacity bag is best suited for long-term sitting situations.